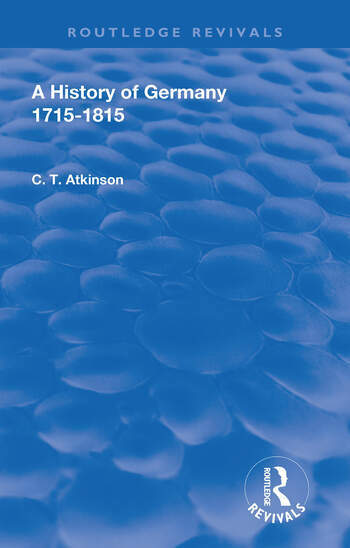 Published in 1908, this book documents the history of Germany between 1715 and 1815. The book explores international relations, conflicts, growth and cultural change in Germany in the space of 100 years. 1. Germany in 1715 : The Empire and its Institutions. 2. The German States in 1715. 3. The End of the Northern War. 4. Passarowitz, Sicily and the Pragmatic Sanction. 5. Prussia Under Frederick William I. 6. The Last Wars of Charles VI. 7. Maria Theresa and Her Enemies. 8. The Austrian Succession War : To the Treaty of Worms. 9. The Austrian Succession War: To The Peace of Aix-La-Chapelle. 10. Maria Theresa’s Reforms and the Diplomatic Revolution. 11. The Seven Years’ War: Campaigns of 1756 and 1757. 12. The Seven Years’ War (Continued): 1758 and 1759. 13. The Seven Years’ War (Concluded). 14. Austria and Prussia After the War: The Partition of Poland. 15. The Foreign Policy of Joseph II. 16. Maria Theresa and Joseph II : Domestic Affairs. 17. Leopold II and the Eastern Question. 18. Germany and the French Revolution. 19. The First Coalition. 20. From Basel to Campo Formio. 21. Rastatt and the Second Coalition. 22. Marengo, Hohenliden and Luneville. 23. The Resettlement of 1803. 24. The Causes of the Third Coalition. 25. Ulm and Austerlitz. 26. The Confederation of The Rhine and the Overthrow of Prussia. 27. Friedland , Tilsit and Erfurt. 28. Austria’s Effort to Overthrow Napoleon. 29. Germany at Napoleon’s Mercy. 30. The War of Liberation: Till the Armistice. 31. The War of Liberation (Continued) : To the Battle of Kulm. 32. The War of Liberation (Continued) : Leipzig and Hanau. 33. 1814 and the Treaty of Paris. 34. The Congress of Vienna. 35. The Hundred Days.